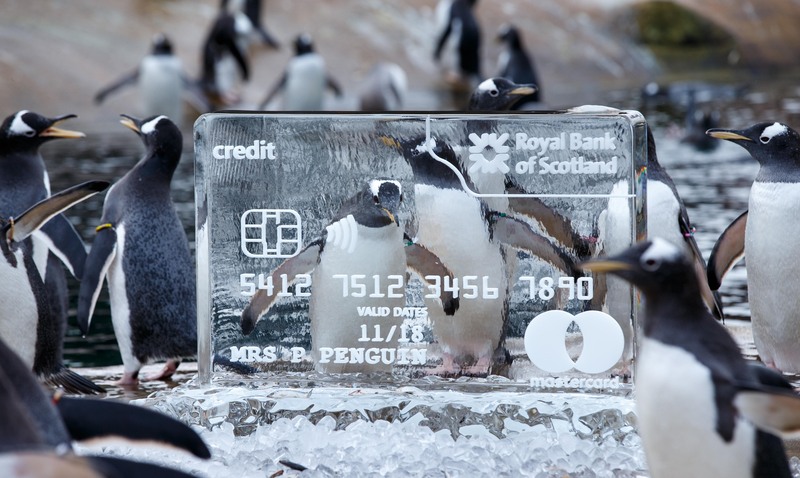 On a cold and drizzly November day at Edinburgh Zoo, our resident penguin colony were pleasantly surprised to find three frozen credit card ice sculptures installed in their enclosure. This unusual turn of events marked a partnership between the Royal Zoological Society of Scotland and the Royal Bank of Scotland. In exchange for a donation towards the care of our animals, Royal Bank of Scotland were on site with photographer Robert Perry, to launch a new service for their credit card customers, who are now able to freeze their cards using the mobile app instead of having to unnecessarily cancel them. To launch this new feature, they installed the ice sculptures at Penguin Rock, much to the amusement of our penguins. Ice acts as great enrichment for our birds, reminding them of their natural habitat in the wild, and providing a fun and interactive experience for them. If you and your organisation are interested in discussing bespoke corporate opportunities at Edinburgh Zoo, please contact our Development Coordinator Christianne McKenzie at cmckenzie@rzss.org.uk or on 0131 314 0380.